We have an expression around the South that dates back to when writing letters was commonplace. Let’s say you tried a recipe that didn’t go over too well. You might say, “It was nothing to write home about.” Even back when we wrote letters, we acknowledged that taking the time to “write home” about something was special. And today, I’ve got something special to share with my home readers. It’s a lovely book called Letters from Home by Kristina McMorris who’s on a WOW! Blog tour this month. Kristina McMorris lives in the Pacific Northwest with her husband and two sons. She has garnered more than twenty national literary awards since writing her first novel, Letters from Home. A graduate of Pepperdine University, she spent twelve years hosting weekly television shows, including an Emmy® Award-winning television show at age nine. Prior to her literary career, she was the owner of a wedding/event planning business and public relations director of an international conglomerate. In the midst of World War II, a Midwestern infantryman falls deeply in love through a yearlong letter exchange, unaware that the girl he’s writing to isn’t the one replying. Woven around this tenuous thread are three female friends whose journeys toward independence take unexpected turns as a result of romance, tragedy, and deception, their repercussions heightened by an era of the unknown. 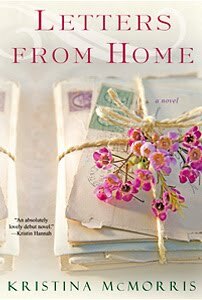 “Ambitious and compelling…[a] sweeping debut” (Publishers Weekly), LETTERS FROM HOME is a story of hope and connection, of sacrifices made in love and war – and the chance encounters that change us forever. “Throughout history, forms of communication have evolved. Telegrams have become phone calls. Mailed documents have become faxes. Letters, even to express adoration, have generally become quick, convenient electronic messages. The photo you sent was fab…might have to blow it up life-size, LOL. The benefit of speediness in today’s correspondence is inarguable. But have we lost something meaningful in the process? No matter how heartwarming the message might be, how many times do you reread an email? Or a text? A tweet? Until a few years ago, I had no idea my grandparents had met only twice during WWII before getting married. Upon revealing this astounding tidbit, my grandmother retrieved from her closet a secret collection of the wartime letters responsible for initially forging their bond. “Every night I dream of you and those nights and days we have spent together. There shall never be another for me but you, Darling. Every part of me is true blue to the one I love…..Gee, Darling, how happy I would be to let you sleep on my arm tonight and every night from now on. I love you! Just 62 more days! Bushels and bushels of kisses, Hon. Indeed, that is the type of letter worthy of repeated readings. In fact, this was the very stack of letters that inspired me to write my first novel, LETTERS FROM HOME, thereby changing the course of my life. I think for me, it was the summer I spent in Europe. But I have a feeling I left out all the good stuff in that letter! P.S. You know every letter has to have a P.S. Here’s yours: For more about Kristina and her book, Letters from Home, check out her website at kristinamcmorris.com. P.P.S. Oooh! Remember the P.P.S.? I forgot to tell you that the giveaway runs through Monday. I want to give all my readers plenty of time to write home to Cathy C’s Hall of Fame for a chance to win! I love handwritten letters. I have kept mine over the years. Every so often I take them out to read, savoring the tender thoughts, the flashes of enlightenment and the meaty selections of everyday descriptions.Letters for Home is just what we all need to remind us of the beauty of the written word on paper. This looks like my sort of book. My husband and I did many of those countdowns while he was in the Navy. Many of them were via email, but I also have a fondness for mailed cards (I kept the local Hallmark in business!). We both kept everything, which should make for an interesting legacy someday. Oh, I get a little goosebumpy, thinking about handwritten letters. Remember how excited we'd be if a letter came in the mail?I've been excited by a few emails, too, I guess. But it's not the same as reading crazy handwriting, seeing the scratch-outs, or all the misspelled words. Letters have so much personality!Good luck, y'all! Wish I had a book for each of you! I have tons of love letters from my husband throughout our 32 years together. Some are scribbled on torn pieces of paper. I plan to put them in a scrapbook one day for my great-great-great grandchildren. Or for me.Hope I win Letters From Home!! I need to read that book. I'm seriously choking up a bit, hearing about your letters. Letters from soldiers, grandparents, long-time loves…you should ALL write a book.Lucile, I missed y'all, too. I got behind with the conference and haven't caught up yet. Lord willing, I'll be there next time! I was recently cleaning out the attic and found a box of letters from my husband's deployment to the Gulf War. Among my mundane descriptions of daily happenings (I did not want my husband to miss a single moment of our children's lives) were precious artifacts from my daughters–lipstick kisses, drawings, pictures, and words of love to their father.It was like stepping back in time! A treasure, pure and simple. I couldn't have said it better myself, Veronica. How wonderful to find that treasure trove of memories!Thanks for sharing here, and dropping by. I used to write letters to my old college friends all the time and still miss getting letters in the mail. This story sounds right up my alley and I requested it at the library as soon as I read your blog. Thanks, Cath — keep the great titles coming. Cathy,Letters are the only real connection I have with my best friend who has dementia and is unable to respond. I could send the same letter every week, and she'd never know the difference, but I don't. It makes her day to receive a letter. It's my weekly offering of kindness. I'm so glad you had a chance to stop by, Kristina! I hope you drop in again before the drawing to read more comments like Linda's.Linda, you are a special person. My heart is smiling. Cathy, hop over to my blog, surprise for you! Interesting and true. In some cases, texting has not just taken the place of writing letters, but of telephone calls, too. My teenager went months texting her boyfriend…they rarely actually spoke on the phone. How bizarre is that? With both of my parents gone, there is no longer that home to write to. I do have letters they wrote to me right after I married and moved away. I'll keep them forever and, yes, read them over and over again. Just seeing their script on the paper is a comfort.